It had to happen sometime: a ChristianWeek columnist has finally directed a film. And what an inspiring, unsettling, thought-provoking film it is. David Di Sabatino, who once wrote the ‘Gadfly’ column in these pages, was still putting the finishing touches on Frisbee: The Life and Death of a Hippie Preacher as this issue went to press. After screening rough cuts of the film at various evangelical churches and colleges, his documentary, about a controversial figure who helped start the Calvary Chapel and Vineyard movements, is due to premiere at the Newport Beach Film Festival in late April. 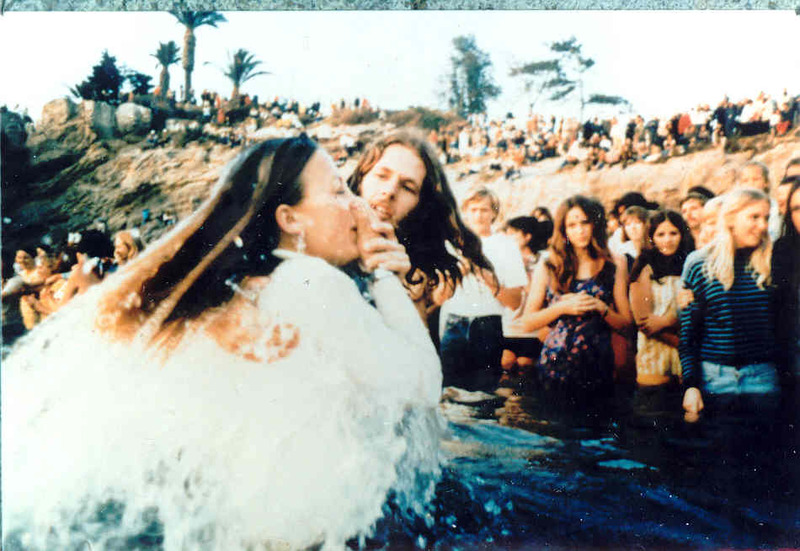 The film was inspired by the research Di Sabatino did for a proposed book on the Jesus Movement, that moment in the tumultuous late ’60s and early ’70s when counter-cultural youth and evangelical faith came together in an explosive mix of dispensationalist theology, social experimentation, and evangelistic rock’n’roll. At the heart of it all, the film suggests, was a figure who received a lot of attention at the time but has largely been forgotten in the years since. Lonnie Frisbee was still just a teen when, he claimed, God appeared to him in a vision and told him he would bring many people to Christ. One day while hitchhiking in 1968, he was picked up by a man who happened to be dating the daughter of Chuck Smith, and Chuck, in turn, was looking for a way to make the gospel relevant to hippies. Chuck’s wife said Lonnie would help bring thousands of people to the faith. And so it was: together they baptized hippies all over the California coast. By all accounts, and judging by the archival footage Di Sabatino has retrieved, Lonnie was a charismatic preacher — and in every sense of the word. While writers like Hank Hanegraaff have dismissed Lonnie as a mere “hypnotist”, some of the film’s interviewees swear they saw him perform miraculous healings, such as giving sight to the blind. Di Sabatino, who quit his job as editor of Worship Leader magazine to focus on filmmaking, goes so far as to say that Lonnie Frisbee was like an Old Testament prophet — and in the opening credits, he even calls his film “a Bible story”. Bible stories can be pretty complicated, though, and eventually, for reasons too complex to get into here, Lonnie and Chuck Smith had a falling out. However, within a few years, Lonnie had hooked up with another soon-to-be-famous evangelical leader — John Wimber — and he left his imprint on the “signs and wonders” movement, too. So why was Lonnie written out of the history books? Largely, the film suggests, because Lonnie — whose long hair, shaggy beard, and piercing gaze invited comparisons to Jesus but also bring Rasputin to mind — struggled with sin. Specifically, sexual sin. Even more specifically, he struggled with homosexuality, and he died of AIDS in 1993. Di Sabatino is emphatic that Lonnie not be turned into a poster boy for gay Christians — but he insists on facing this aspect of Lonnie’s life honestly, the same way the Bible describes the adultery and murder committed by King David, or the sins committed by Samson. Some people have accused the film of having a pro-gay agenda — partly because it includes interviews with the Metropolitan Community Church’s Bishop Troy Perry and evangelical-author-turned-gay-activist Mel White — but that is not how the film comes across, to me. If anything, those who believe homosexuality is the result of a dysfunctional upbringing will find their beliefs confirmed when the film reveals that Lonnie’s father abandoned the family early on, and that a babysitter may have molested him when he was only eight years old. What the film does do is challenge the way the church has tended to treat homosexuality as if it were an unforgivable sin. Di Sabatino, speaking to ChristianWeek from his home in Lake Forest, California, says Lonnie was discouraged from being honest about his struggles — and thus perhaps from dealing with them — by the stigma attached to them. “His early testimony at Calvary Chapel was that he had come out of the homosexual lifestyle, but he felt like a leper because a lot of people turned away from him after that, so he took it out of his testimony — and I think that’s an indictment of the church,” he says. Beyond those sorts of issues, the film offers a compelling portrait of an idealistic, revolutionary time when rebelling against “the man” fit hand-in-glove with following in the footsteps of Christ. The film’s soundtrack captures the feel of the era very well, with songs by Larry Norman, Love Song and others — it is especially uncanny how many of Larry’s songs can be matched to specific episodes in Lonnie’s life — and Jesus Music veterans like Chuck Girard are on hand to provide their own perspective on Lonnie’s ministry. While the film is a little rough around the edges on a technical level, it’s an eye-opening look into a part of church history that could all too easily go ignored. Read the full transcript of Peter T. Chattaway’s interview with director David Di Sabatino at his blog, here.